A "blundered" counterfeit of a 7th Century coin described as rare by experts has been declared treasure. 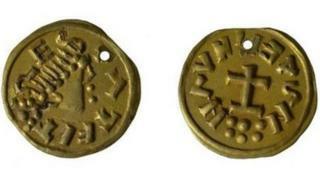 Suffolk coroner Nigel Parsley was told the coin was an unofficial copy of a gold Merovingian tremissis, originally minted in Dorestad between 630 and 650. It was heard the legends on both sides of coin, found near Woodbridge, were spelt wrongly. Archaeological officer Faye Minter said Anglo-Saxon coins were valuable and "rare, counterfeit or not". She said it was thought the coin was used for jewellery, as it had been pierced and there was a "general lack of wear". Miss Minter told the hearing in Ipswich the legends on both side were "blundered" to a degree which was "unusual in official issues of this coinage". She said it was about 0.3g lighter than usual and was thought to be made in the decades after 650. The coin was found in autumn 2016 through metal-detecting on ploughed land.